Vintage Construction Trucks and Equipment. 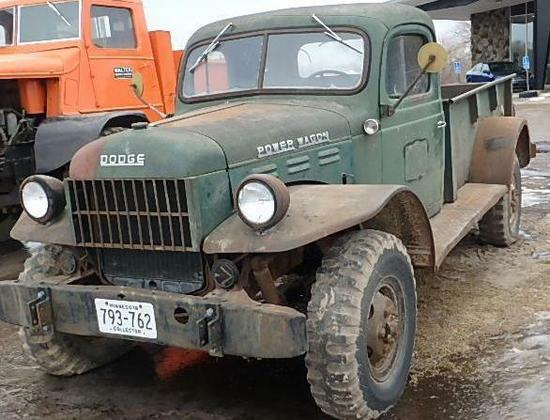 Dodge Power Wagons, Chevrolet's from the 1980’s, 1959 Caterpillar D6. Payment Instructions: Payment is required within 24 hours of conclusion of auction and can be made at the time of scheduled pick up. Checks must be made payable to Fahey Sales Auctioneers & Appraisers. 10% buyers premium applies to payments by cash, check or wire transfer, 14% buyers premium applies to all purchases by credit card. A 20.00 fee applies to wire transfers. Items not paid for within the required time will be charged to your credit card on file with proxibid. Adjustments in sales tax (if applicable) may be made at the time of payment. Additional excise tax and transfer fees apply to lots requiring registration. ************** IMPORTANT PLEASE READ ************** If sending a Freight Company or third party to pick up your purchases, a bill of lading MUST be emailed to sold@faheysales.com or MUST accompany the driver at the time of pick up. Fahey Sales Agency MUST NOT be listed as the shipper. The BOL must also mention the purchaser as well as the items they are authorized to pick up. Items will not be loaded and BOL will not be signed if our company is listed as the shipper. NO EXCEPTIONS. Checkout Date & Times: Wednesday, February 13 from 8 a.m. to 5 p.m. NOTE: NO TITLE OR REGISTRATION WILL BE PROVIDED WITH THIS VEHICLE. IN ORDER TO TITLE MUST GO THROUGH BONDING PROCESS. You've been outbid to 1****2! to YOU! Features and Notes: Red, front snow plow 7 1/2ft, in box: fuel tank, Craftsman 3 HR 20 gallon air compressor, Champion 220 AMP generator, Delta tool box, Snap-On tool box with tools, spare tire. You've been outbid to i****2! to YOU! You've been outbid to Z****s! to YOU! 10ft v-plow, each side 72"L at base, max height 58"